With a floating pedestal for your office storage, you don't need to commit to one space. With four caster wheels, it can easily be moved from one corner to another until you find the right positioning for it. 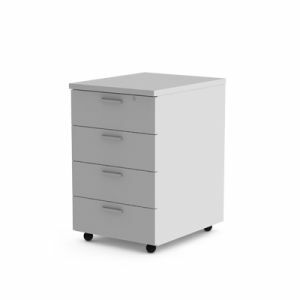 Store all your essential work items in a safe, secure, lockable mobile pedestal, with four drawers offering ample space. Each office should have this piece of furniture in it for effective storage and to help maintain clean lines and professional appeal in the office space. If you have any questions about this piece of essential office storage furniture, give us a shout, otherwise add it to your enquiry and let's get your office space kitted out!